Curated by Rachel Tibbetts and Ellie Schwetye, produced by Slightly Askew Theatre Ensemble (SATE). St. Louis. March 15-17, 2019. In St. Louis, after the lights went down in the large, fourth-floor dance studio in the heart of the Grand Center Arts District, two women greeted the audience. 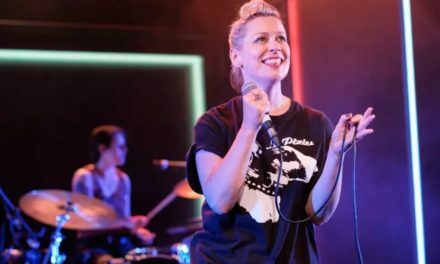 They were Rachel Tibbetts and Ellie Schwetye, the Artistic Director and Managing Director, respectively, of Slightly Askew Theatre Ensemble (SATE), and the loud, sustained applause they received indicated they were much beloved by the crowd. After introducing themselves, they introduced the Aphra Behn Emerging Artists’ Festival, named after the Restoration “playwright, poet, and spy,” in their words, and, perhaps more importantly for this festival, the first “professional woman playwright.” The festival was well-named because it provided a space for local female theatre artists—particularly playwrights and directors—to get much-needed early career experience and exposure. This type of opportunity is necessary in the contemporary U.S. theatre scene. The Count, an ongoing study by the Lilly Awards and the Dramatists Guild, found that at regional theatres across the U.S.A., only 22% of new plays were written by women. The League of Professional Theatre Women estimates that women make up only about 37% of Off-Broadway directors. Thus, there is a real need—in St. Louis and around the U.S.A.—to provide breaks for women playwrights and directors. The Aphra Behn Emerging Artists’ Festival is just that, and SATE is the perfect St. Louis theatre to take on this mantle. SATE has always been led by women, and its identity in the St. Louis theatre ecology is that of a theatre dedicated to women artists. It was originally founded in 2005 by Margeau Baue Steinau as a weekly meeting place for people to train in Anne Bogart’s Viewpoints and Tadashi Suzuki’s movement methods. As this work continued, however, the people involved felt that the logical endpoint for this type of training was a public performance. This led to SATE’s first productions. Since 2005, the company has trained in many other methods and continued to produce, all with a philosophy of inclusion. 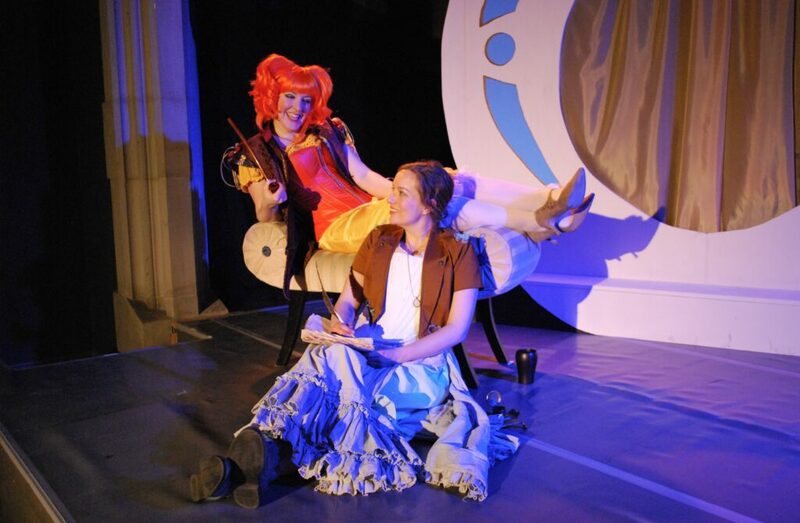 In 2015, SATE’s current leadership, Tibbetts and Schwetye, wanted to produce a play by Aphra Behn, inspired, as they were, by her work as a theatre professional in Restoration England. While researching Behn’s work, they came across the play Or, by Liz Duffy Adams, and put that on. The following season, in 2016, they produced the first Aphra Behn Emerging Artists’ Festival. This year is the third iteration of the Festival. Though the submission and selection process of works and artists has changed slightly over the three years of its existence, the Festival has always been centered on Tibbetts and Schwetye’s desire to provide to young women artists a place to experiment and shine. Tibbetts and Schwetye received this opportunity in their early years from SATE, and want the company to continue to deliver it. If the atmosphere of this year’s Festival was any indication, for three years Tibbetts and Schwetye provided a comfortable, informal space for woman artists to experiment. The festival took place at the Centene Center for the Arts, a space built in the 1880s as a dance studio, but then revamped into the headquarters of the Knights of Columbus in 1907, resulting in gothic white glazed terra-cotta façade, and ornate ironwork. In 2006, after nearly 20 years empty, the Centene Center for the Arts was launched with office space, rehearsal rooms, a ballroom, and multi-use performance spaces. It is in the midst of the Grand Center Arts District, an area of St. Louis that houses many performing arts spaces, from the large venue for touring Broadway to small converted church spaces to live music venues. The official webpage for the neighborhood bills it as “a unique place where emerging acts can coexist and connect with the pros.” That type of connection with more established artists is one of the goals of the Aphra Behn Emerging Artists’ Festival, making the Grand Center Arts District the ideal location. Walking up the stairs to the fourth floor of the Centene Center for the Arts, I was struck by how each level had a comfortable sitting area within a square of ironwork in what used to be the exposed elevator shaft. This reflected the building’s modern use of older space, but also how the architects retained and repurposed the ornate past. The modern elevator had its own space off to the side, and, upon reaching the fourth floor, the artistic director, Tibbetts, was running the box office at a folding table with a small bar behind her. Immediately, this level of involvement from the artistic leadership created a welcoming, informal, and exciting evening. The bar continued this festive atmosphere. Space itself was a large dance performance space with stackable, plastic chairs laid out in two square sections with an aisle down the middle. In front of the chairs was a platform a few feet high lit by a couple of lighting trees on either side of the audience. The controls to the lights and sound were on a folding table behind the audience. The managing director, Schwetye, was sitting near the lightboard and was also available and friendly. The stage manager, Summer Baer, complimented my wife’s t-shirt because of its feminist logo, and many in the audience seemed to know each other, talking, drinks in hand, like a party expectant of an exciting show beginning shortly. Because the plays were in development, it is inappropriate to review the texts in too much detail. 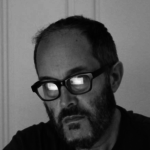 But, by going through the plays, providing a synopsis of each script, and a description of the direction and the acting, it will be possible to describe the exciting work being done at the Festival. The first play was Burden Of Proof by Delaney Piggins, directed by Kristen Strom, featuring performances by Maya Kelch, Samantha Auch, Sophie Murk. The compelling script tells the story of four women driving from college back to their hometown in order to testify against a high school teacher accused of sexual assault. The script moves skillfully from the present day conversations in the car to moments in the courtroom, to abstract, almost dream-like, memories of the past. The direction did much with little—four chairs on the floor to indicate the car; microphones in stands on the platform to indicate testifying in court, and those same microphones to indicate the women’s past experiences reading poetry and performing in a rock band in high school. The directing kept the action of the script clear and provided visuals without becoming so complicated that the workshop performance overwhelmed the script development. The acting, likewise, was uniformly strong, with each of the women providing a nuanced view of their character’s experiences. The second play, Intervals by J.M. Chambers, was directed by Jeanitta Perkins with performances by Chris Ware, Madelyn Boyne, Vicky Chen. This script resembled docudrama because it was a collage of monologues following how three characters’ lives were affected by homelessness. The first character was a white woman in her 20s who worked a job but was living in her car. Her character was extremely developed, and she took on the role of the narrator through the device of talking a diary into her phone. The next character was an African American man who worked in an upscale grocery store but, nevertheless, had to couch surf with friends for years while trying to save up enough money to get an apartment and bring his daughter to live with him instead of with his parents. Finally, the last character was an Asian American teenager in high school whose family was homeless and who had to live in shelters and, sometimes, their van. 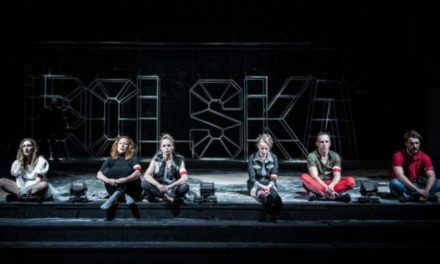 All of these characters, by the end of the play, have ended their homelessness, and one of the play’s messages is that, in America, most people who are homeless are employed and only temporarily homeless. The directing did a good job of indicating a location with only a few props and had the actors walking around the audience, utilizing all three aisles, which was effective since the play was almost entirely made up of direct address. Again, the acting was uniformly strong, establishing a compelling connection between these characters’ experiences and the engaged audience. 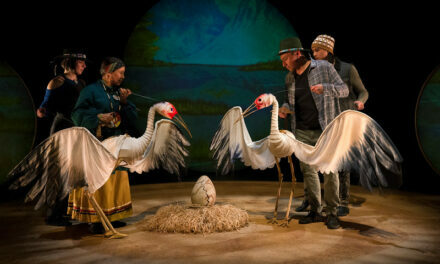 The final play was a 10-minute piece whereas the other two were one acts. Simply called V, author E.K. 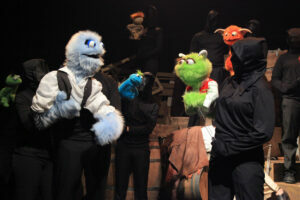 Doolin created a comedy that left the audience laughing as it exited the theatre. It was set in a yoga studio from hell with a young woman there for the first time being hit on by an obnoxious French man and annoyed by a flatulent man (played by a woman) whose grasp of reality was questionable. Director Lana Dvorak mined the script for all its humor, particularly in the physical dimension. Ryan Lawson-Maeske, who played the aggressive French man, performed some incredible yoga during the play, all the while utilizing a ridiculous French accent to great comic effect. 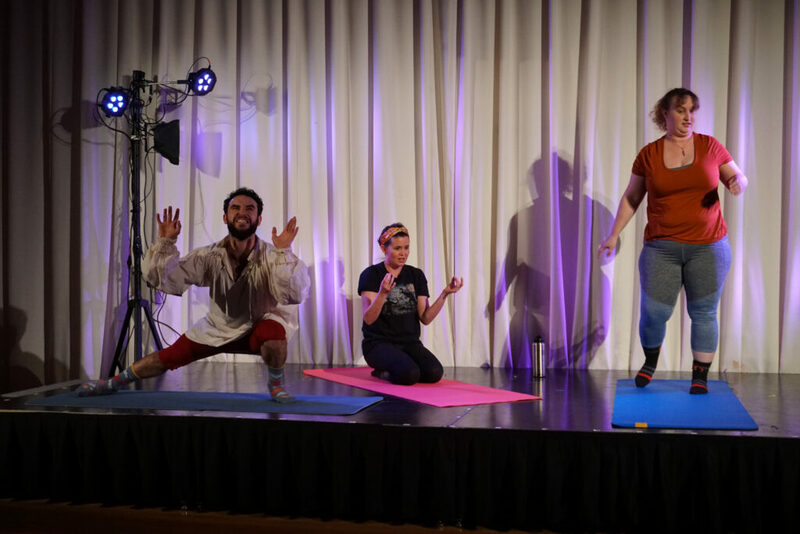 Kelly Howe, also demonstrating extreme flexibility in her yoga poses, provided the festival’s final comic moment: faces worthy of Lucille Ball while long sound effects of farts played. The audience loved it, and Morgan Maul-Smith was the perfect straight person to make the comedy work. 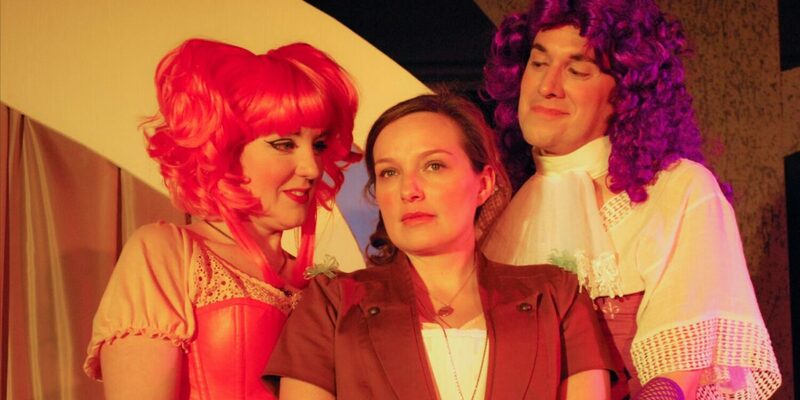 The Aphra Behn Emerging Artists’ Festival was a study in balance. 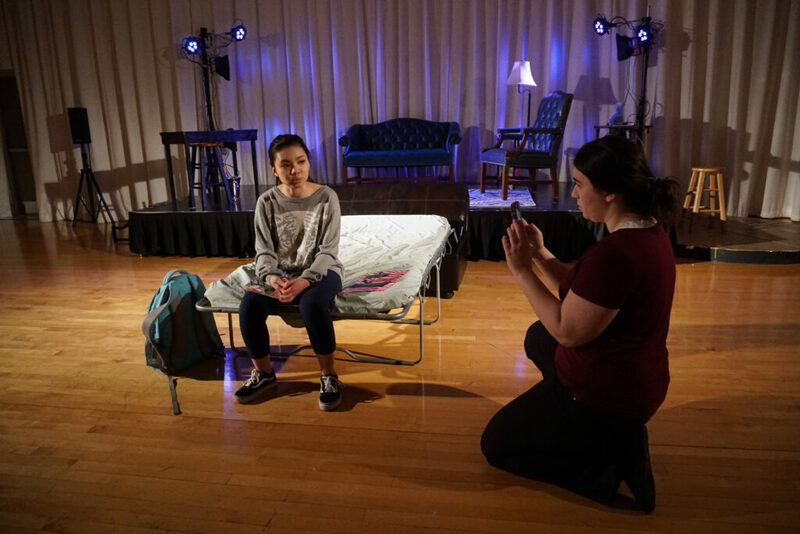 The plays contained a great deal of information—about surviving sexual assault, about homelessness—but never left behind the emotional reality of the subjects. Though the plays were workshops, the direction in each of them created exciting visuals while providing a thorough exploration of the text. Similarly, the Festival balanced the poles emotion, from anguish to fart jokes. 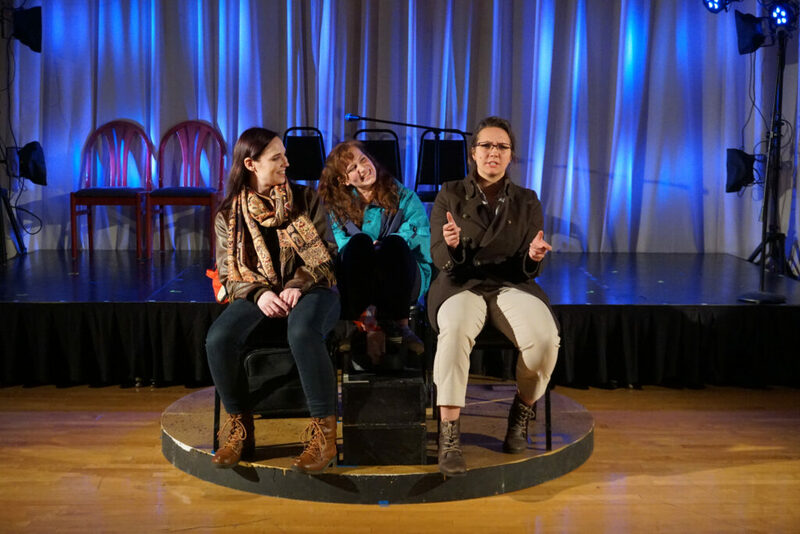 The Aphra Behn Emerging Artists’ Festival is an important venue for local artists, particularly for the next generation of women theatre-makers. In St. Louis, Rachel Tibbetts and Ellie Schwetye are doing a fantastic job of paying it forward.